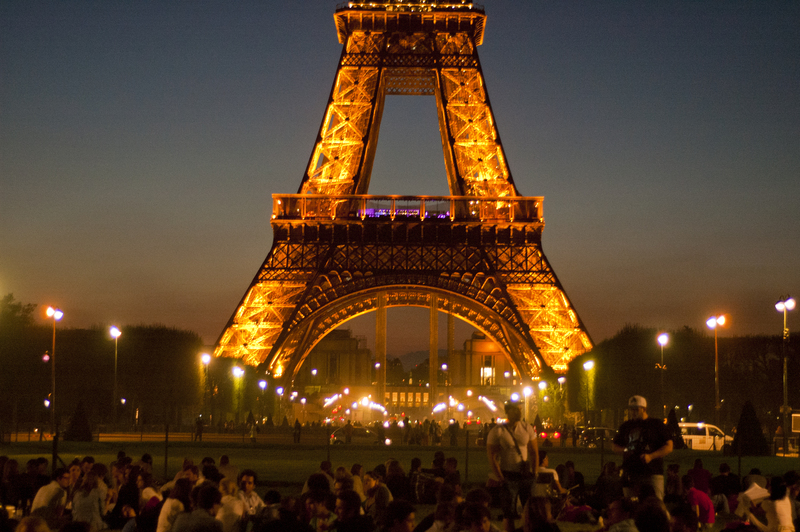 Paris, the first leg of our most recent and last trip abroad, was one for the books. Rima and I spent five days in the City of Light (by far our longest stay anywhere other than London) and did our best to transform into the French ladies that lie within. Speaking of spending time outside of the Louvre, this goes out to all the illegal street vendors who harassed us there and at the Eiffel Tour. Rima figured out how to say “what you’re doing is illegal” in French, which then just made them awkwardly mock her. I did the best I could behind my significant language barrier and proved to be no help when Rima was called Lady Gaga not once but twice by two different people. I think her leopard print coat definitely had something to do with it. Très, très bon. I still can’t decide which night was better: our last night in Paris or that one night in Geneva. The last night in Paris, we met up with some friends on the BU program who were also in Paris and ended up in this tiny fondue place in Montmartre that serves wine in baby bottles. It sounds weirder than it actually was, though that was certainly helped by the hour spent beforehand at the neighboring bar that had glasses of wine for €3. There were also issues with some sort of reservation, but Rima was the French knight in knitted leopard print, arguing with the restaurant owner. So, we not only got seated, but got free drinks and enough charcuterie to make your head spin. I somehow managed to spill wine on myself despite the baby bottle situation (I did take off the top because it was still weird), but the drinks, company, and cheese were top-notch. Then there was our one night in Geneva. We stayed with my aunt who lives there and who took us to this big Christmas party that was being held in some swanky hotel. Apparently last year’s fête had been a blast, so we put our best dresses on and cabbed it over. The performer for this year’s party was a Lady Gaga impersonator, but it was awkward because she actually just looked like my friend Emily wearing a kimono, sunglasses and red lipstick. Go figure. The people watching was also top-notch. There’s a sizable ex-pat population in Geneva, many of whom are from Eastern Europe and really go all-out with their feathers, sequins, skin-tight dresses and gold lamé. Good stuff. So folks, this is the end. There’s still five days left of my abroad experience, but most of it will be spent packing, “studying” and crying into the nearest pint of cider. It’s hard to explain what exactly I’ll be crying about. Sure, London is awesome, but it’s been far from my favorite city that I’ve visited this semester. The first half of the abroad program sucked, for the record, and it took a long time to get over my initial culture shock and subsequent FOMO. As I’m sure many of you are experiencing this summer, getting out of bed every Monday to Friday to schelp myself to my internship is undoubtedly the hardest part of the job. In Paris, I would reward myself simply for waking up in the morning – on time or not – with a gorgeous buttery croissant from the corner boulangerie, reveling in the delicate pastry’s apparent apex of warmth and overall exquisiteness in the morning. 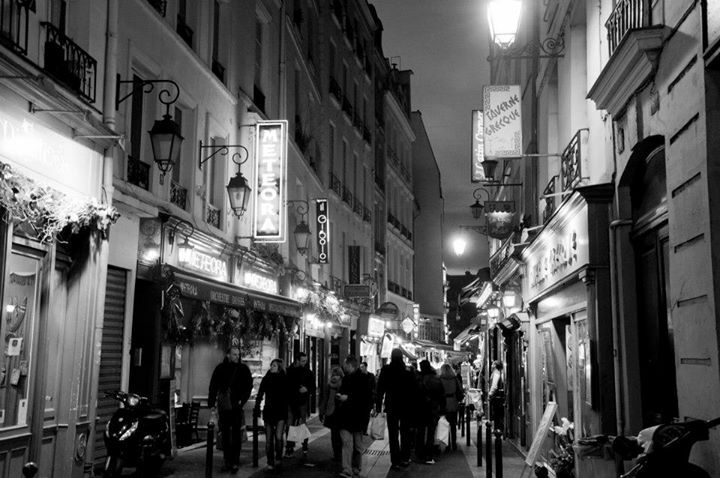 Memories of my stint in Paris come back to me in bursts: the lazy, lingering lunches at cafés for as long as I pleased to stay, the second-hand smoke that resulted from sitting outside at such cafés, the mandatory greetings uttered upon entering and leaving a shop. Picnics where the bread would be the first thing to run out and the remaining cheese the next, the store-bought pudding cups in impossibly fragile and petite jars of glass, the satisfaction I felt when inventing a French sounding word and then realizing it was indeed real. At the close of our semester abroad, us BU Paris Internship students were forced to attend a mandatory end-of-semester workshop. Mostly, the professors were warning us against reverse culture shock. In typical Parisian fashion, we scoffed, dismissing the idea as ridiculous. It had only been four months, after all. Yet, when I walked into my local mall’s food court but a couple weeks later, the reverse culture shock was all too real. Dollar hamburgers on fast food menus! A small soft-drink from Wendy’s being 16 times the size of a typical European espresso! PEOPLE IN PAJAMAS! Quel horreur. Mostly, I miss the challenge of simply stepping outside the confines of my bedroom. To communicate my intentions, personality, sense of self, to my host mom, boss, and teachers in a different language was the ultimate test of my will and self-confidence. I miss learning des petits trucs every day about French culture, politics and strangers. 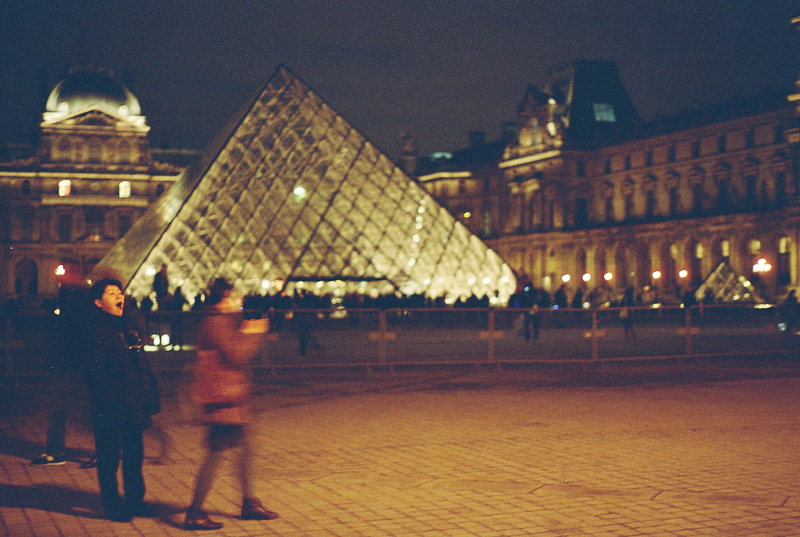 I miss the humbling feeling of being a curious, wide-eyed student of Paris, France and of the world. But above all, I miss baguettes. At the close of my time in Paris, it’s jarring to think about the difference between the Paris I imagined and the Paris whose streets I traverse every morning on my way to work. Just like I have struggled with washing machines, irons, and electricity, I have had difficulty finding the unconditional love for this city I was sure would come so easily. The first day I left my apartment to head to the BU Paris campus, the sky was a muddled dim grey, peeling back the layers of black in the sleepy morning. It was 8:30 AM. Shockingly enough, Paris rested under (a lighter) gray sky for the rest of the day – and then for another 3 months. For every error in judgment regarding the French language, crisis in the home of my host mom, and flash rain storm whilst I’m out walking, there’s also been tulips in bloom in Tuileries Garden after a long winter, falafel tasting on the Rue de Roisiers in the Marais, and the reassuring searchlight of the Eiffel Tower after a weekend spent far from home. But Paris isn’t just the Eiffel Tower. It isn’t the Champs Elysee, the Louvre, the Notre Dame. It’s the violent dark blue glow of the pre-dusk sky reflected in the glass café windows in Montmartre, distorted reflections of the corner bistro cursive on the sodden sidewalks of the Latin Quarter, crackling neon lights advertising peep shows behind lush drawn curtains in Pigalle. 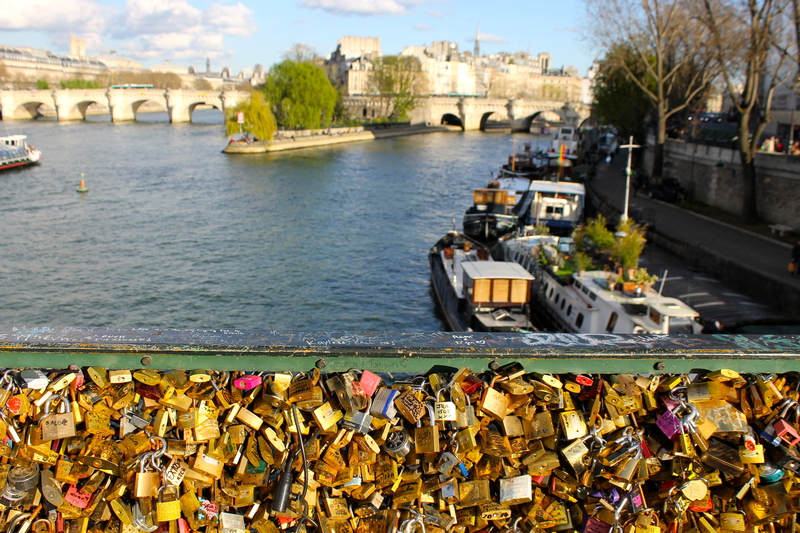 After exploring arrondissement by arrondissement, pockets of Paris far from the Seine, and hidden passageways in between corridors of alleyways – I’ve found myself incongruously falling in love and will be leaving justifiably enamored. It wasn’t long ago that I was a senior in high school, sitting in what I was to be sure to be my last French course ’till the end of time. I happened to glance over at the door and through the glass window, to see my friend Jason knocking discreetly. With the confirmation of my eye contact, he grinned sheepishly, and pulled up a poster for me to view through the glass that read: ABBIE LIN – MOI ET TOI – PROM? Well – suffice to say, that wasn’t my last run in with French. And like how my supposed last French class was never to be, I am sure that before long, Paris’ contradicting charisma will pull me back for more. So far, one of the most palpable disparities between Europe and the United States that I’ve noticed is in its’ citizens environmental consciousness. How many bags did you last use in your trip to Shaws, 10? While they have plastic bags for purchase in Paris, each one costs the equivalent of four cents. While it seems like chump change, obviously it adds up. Personally, to avoid the charges, I’ve been seen juggling a jug of milk, a block of cheese, cookies, and oranges back to my apartment from the supermarket. I’ve gotten the infamous Parisian snobbish stink-eye multiple times, but as long as I get back to the apartment with all my goods, it’s worth it. I didn’t notice the types of bags offered to carry purchases from clothing stores at first, but my host mom pointed out that Gap— an American company— uses plastic bags rather than the customary paper bags provided by most other fashion companies. The French don’t see themselves as being especially “green,” rather, the cognizance of conservation is engrained in their culture. This is speculation on my part— but the French take short showers since water is especially expensive, so perhaps that’s why there’s a stereotype that they smell? (Read: a joke). In my apartment building and in most other buildings in Paris, all the lights are off for most of the day, by default. They aren’t motion-detection sensored, and require the good ol’ use of effort to manually turn them on. They stay on for a pre-determined fraction of time, before they shut off again. One night, as I closed the door, I pressed the button for the light in my corridor’s hallway. 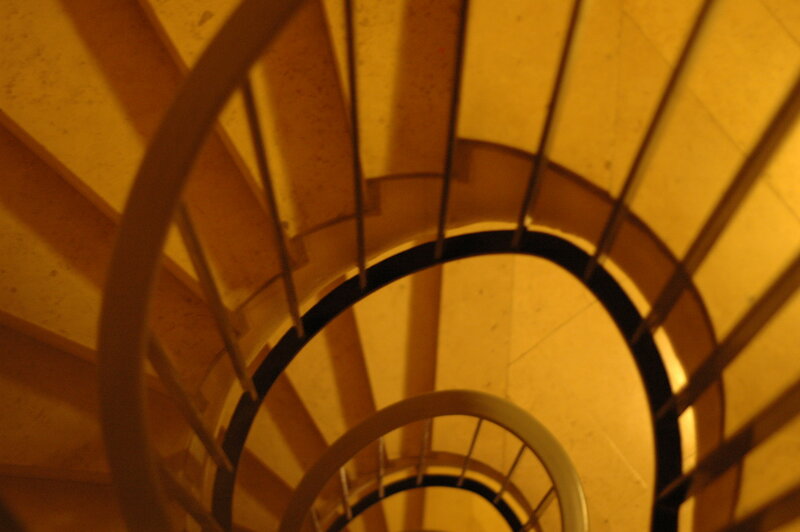 I took an unusually long time to lock the door, and as I stepped four steps down the marble spiral staircase, I was met with debilitating darkness as the lights clicked off. I grappled my way over to the stair rail, fending for myself in a cold, dark world; I imagined slipping and faceplanting mere yards away from my front door. Surely the embarrassment alone would kill me. As I navigated my way blindly down each successive step, I finally hit the third floor. As I shuffled over, one cautious foot in front of the other, I got to the light switch, and began my carefree descent. Another small victory in ma vie quotidienne Parisien. Abbie is a junior advertising major at Boston University and former photo editor of the Daily Free Press. She is spending the semester abroad in Paris while participating in the BU Paris internship program. She will be writing a series of weekly posts in which she explains her efforts to understand and adapt to the culture– which may not always be successful, but will undoubtedly be entertaining. Grasping at the precipice between the cab and Paris, ravenously breathing in the gritty, damp air, one could imagine my excitement at having arrived in a new country to be called home for a whole semester. 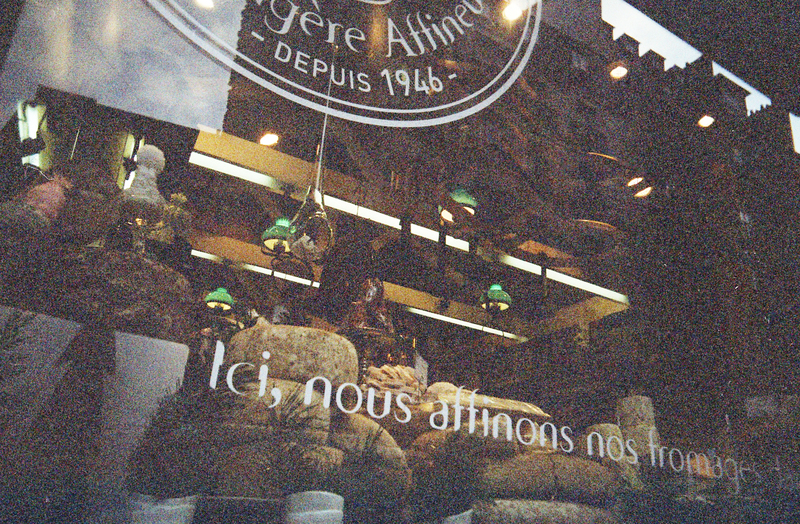 We passed by multiple people walking with oblong baguettes in tow, script-laden signs of corner cafes and brasseries, a huge open-air market teeming with Parisians and fresh fish in the north of the city. Imagine my surprise when at the end of my ride, the cab driver turned around and said, “Cent euros, s’il vous plait.” Not sure if I had misheard or if my French knowledge of basic French numbers was even worse than I had anticipated, I asked him to repeat it. “Cent euros, madame,” he stated matter of factly, awaiting my payment. Feeling helpless in a new country, I handed over my 100 euro bill without a protest. As I buzzed the apartment of my host mom, rapid-fire French was spit out of the intercom, and I somehow was able to manage blabbering out my name. After appearing, and introducing herself, she gauged from my wide-eyed response that I was having trouble and she asked if I understood French. Pleased that I understood, I uttered, “un peu” (a little). And by “un peu” I meant I had studied French on and off for eight years. Smiling sympathetically, she took me up to what was to be my home for the next four months. Settling in, I ventured out of my bedroom to to go the bathroom. When I got there, I saw a washing machine, a tub with no curtain or mounted shower head, I was bewildered to say the least. Embarrassingly, I asked my host mom where the toilet was. She led to the next door over, and pushed it in for me. A tiny closet, it contained the toilet and nothing else. “Bof,” I thought (Bof= sound of exasperation uttered by French people on the daily). Adjusting to the cultural norms of this country, not to mention navigating the nuances of the language have been at times frustrating, embarrassing, and downright tiring. Since then, I’ve been working on maneuvering the tricky balance between adjusting to French cultural norms, and coming to terms with my place in this crazy city. It’s been two and a half months, and among the most notable things I’ve mastered include: looking stoic and/or angry on the metro so as to not attract attention to myself, avoiding the inevitable mounds of dog poop on the sidewalk, and having unnaturally low expectations of my prospect of viewing the sun on any given day. Things I still haven’t mastered: the art of the French washing machines, as evidenced by the baby green cardigan I’m sporting today, how to get behind working until seven every day (the norm in France), and getting used to men holding Longchamp bags. Follow me on my volatile relationship with the City of Lights through the end of April, and stay tuned for musings on croissants, full time internships in French, and my personal humiliation.